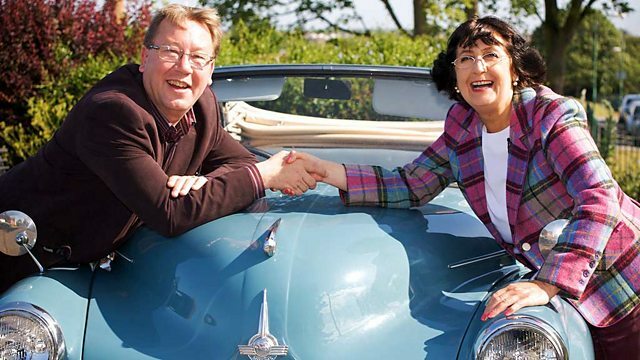 Antiques experts Anita Manning and James Braxton begin the final day of their road trip in the town of Needham Market in Suffolk, ending with a crowning auction in Greenwich. Browse content similar to Episode 10. Check below for episodes and series from the same categories and more! for treasure hunters Anita Manning and James Braxton. ..whilst James isn't afraid to take a punt in the hope to win big. I think I'll have it. So far on this road trip, Anita has seen her profits take off. Last chance then, please, at £130. putting James out in the lead. Both our esteemed experts started this road trip with £200. Anita got off to a gallop, more than doubling her money to £452.86. However, James quickly raced ahead and now has £525.44. could decide the overall winner. They're cruising through Suffolk in a lovely Parisian princess. The 1986 Citroen 2CV6 Special, yeah. The car's lovely, she's behaving absolutely beautifully, as usual. -She has served us very well. -I've loved this wee car. en route to London's maritime borough of Greenwich. in Suffolk, ending with a crowning auction in Greenwich. James currently has a narrow lead, but Anita isn't too far behind. Hasn't been easy, you've been there. You've been there, miffing away. Whether I can hold you back, I don't know. is set in the Gipping Valley of Suffolk. which was a method of preparing wool for the weavers. to seek out a bargain. Are you going to spend a lot of money? You've been urging me to buy big all this time. -And you haven't paid a blind bit of notice! Bygones of Needham Market, where she's meeting owner Paul. -Hello, Anita. How are you? Gosh, he's a bit forward! And looking rather dapper too. -What a colourful and fascinating shop. rather than a tongue sandwich. This could be James when I make my next big profit! and Anita's starting in the basement. That silk gown seems rather nice. It might be just your size, Anita. It's labelled as 1930s, but it could even be pre-First World War. It looks a bit moth-eaten but it's still in reasonable condition. It's got a ticket price of £55. Go on, try it on. Might have a go at it, but I'm going to keep on looking. Please do, and straightaway she's distracted by a big, cuddly deer. -It's been hanging around this corner for far too long. Somebody needs to buy it. Oh, crikey, she's surely not thinking about buying that! Let's look at the price. -That's my line. You're not kidding. Looks like the moths have been at it too. along with that vintage gown with a ticket price of £55. I'm looking at two things that are not in great condition. But they amuse me. That poor wee Bambi over there needs a new home. before it's nibbled completely away! but Anita still hopes to save him. But is it really worth £38? I'd like to be buying him in the region of £12-15. I think Paul might have been glad just to get rid of it, frankly. £15 for an old deer fawn? Let's hope at auction it proves to have been a good i-"deer". she can negotiate a good deal. -We've got some little holes here. but all these folds are in good condition. Anita really needs a reduction on the £55 ticket price. Is there movement to the 20s on that? -Will we go with that? -How much is the mannequin to go with it? I tell you what, if you buy the whole lot, what would you say? -50 quid and I'll give you this. That's a good little lot for just £50. 65 if you include our fluffy four-legged friend. Now, steady, Anita. You've certainly got your hands full here. Meanwhile, James is across town at Station Yard Emporium. It has a range of antiques from a number of different dealers. -Hello, James, glad to meet you. -Hello, and your name is? Today, he's only looking for fresh goods. Come on, John, show me your fresh meat. from around the turn of the century. but this seems to have aged rather well. Ha! -Was it bought well, John? Could this be a special price? I'd have to talk to the dealer who owns it. Let me keep looking, but I like that. when you're trying to sniff out a bargain. Let's hope John has some good news. -What did they say, John? -Well, at this stage, they're saying 85. -It's jolly nice, isn't it? -I'll give them £85. It's very nice. and ahead of Anita if it does well. but with a ticket price of £5, is that too low? to fiddle around with £5-10 goods at this stage. I think I need to buy bigger chunks. It's not cat food, James! But we like what you're saying. Beautifully polished, but it's got quite a dusty bottom. We've had a few dusty bottoms on this show already. Here's something that will blow the cobwebs away. It's a gold-plated, silken, mother-of-pearl fan. Nice, but it's got a big ticket price. 135? The chancers! It's quite a nice one. but saying all that, it's in quite good condition, this. but, actually, it could be earlier. but can John take a few pounds off the asking price? If it were 60-65, I'd buy it. -It depends how well people buy these things. it could help cool you down after the heat of the auction, James. Here comes John with news from the dealer. -Christine can't possibly take 65.
she'll do it for 85. -Her very best, John, is it? 85? I think I'll have it. on his first two items. to Coggeshall, near Colchester, to find out about local cloth making. It's where we find the rather splendid Paycocke's House. Today she's meeting Ros Gurling from the National Trust. -I'm Ros. Welcome to Paycocke's. Come and see our lovely house. The exterior of this building is absolutely amazing. And we've got some even better things to show you inside the house. for wealthy cloth tradesman Thomas Paycocke. where he could showcase the many fine examples of his cloth making. and make Paycocke stand out from his competitors. What would this room have been used for, Ros? and that was the first impression they would have had. and then, of course, these amazing beams. reveals the wealth generated locally by the wool trade. In this instance, a smiling face looking down on all who look up. Ha! -I can see it. It's like a little mask. the house was converted into a terrace of three separate cottages. it developed a reputation for producing exquisite lace. We have an example here of some Tambour lace. to shine a light on their intricate designs. filled with water, and then inserted. -and people could sit round. -So would the women sit round? to work and get more money. by the 15th-century textile industries. it shines once more in its former glory. Ros, thank you so much for telling me all about it. and do come back again. Thank you again. BOTH: Bye-bye! James hasn't the time to engage in such indulgences, however. to do some bold buying. a centre for boat building since the Middle Ages. to see if owner Natalie has any bargains for him. his jewellery box and fan? He may be on his knees, but he's not down on his luck quite yet. Quickly spotting round... This mirror. And it looks like he may have browsed upon something interesting. Natalie, what price could that be? Could that be 40-45? Unfortunately, I wouldn't be able to do that on that particular piece. I'd have to speak to the person it belongs to. If I carry on looking round, do you want to try and propose that? Yeah, I can give them a call. Mirror, mirror, on the wall, who is the cheekiest of them all? Thank you, that's great. Bye-bye. He's kindly said he'll go down to 45. 45? Natalie, I'll take it. Now I'm going to keep looking. His cheeky low offer seems to have worked a treat. and everyone needs a mirror. Mirrors are very popular at auction. That should do all right. £45, it's a good price. Leaves me the opportunity of profit, there. I certainly hope so, if you want to stay in the lead, that is. Three good items. I need another two. I wouldn't mind, I could probably settle at four. This is just as well, as he seems to be struggling to find anything else. All is not lost. It's only day one and there are more shops ahead. but as the shops close, it's now time to retire. and our dynamic duo are up with the larks in the old 2CV. -Yesterday, I'm not sure how sensible I was. I think I had a mad half-hour. Oh, they made me laugh at the time. Whether they will make me laugh in the auction is another thing. and a Victorian silk gown with boa and a mannequin, as you do. Look at that mighty beastie. and the convex wall mirror. but Anita isn't coping too well with the Essex traffic. Oh, James, I'm not sure if I'm very good at traffic jams. We don't have traffic jams in Glasgow. -We don't have traffic jams in Glasgow. Of course there are traffic jams in Glasgow! they've managed to find a car parking space in London. This could be a sign of good things to come. -That was a bit nerve-racking, James. -It was very hairy, wasn't it? -Oh, let's go and spend some money! Come on! Come on, girl. -Hang on, are they holding hands? Camden Passage is a backstreet of curiosity shops and market stalls. That's a terrific big bit of bling. so surely the perfect place to pick up something unique. but she has found a little shop she likes the look of. Hello, I'm Anita. Is it all right to have a look around? that could join her deer from yesterday. It's a figure of a Black Forest-carved cockatoo. but our Anita will be wanting something off from dealer Suki. if we can come down a wee bit on that. Would it be possible to buy that for in the region of round about £20? What is the very, very best that you can do on it? but I'll come down to 28. I like it. It's nice. It's smiling at me. Yeah, but will he smile on your profits? TRADER LAUGHS No, definitely not? We'll go for that. Thank you very, very much. It's lovely. I'll call it Polly. Oh, yeah? So, joining Bambi now is Polly. Ha! Anita is building a Noah's Ark of treasures. James, however, isn't bothering with the shops. to hunt out a bargain. That is a mighty fellow, isn't it? But he has found a needle wallet and combo tape measure. It looks like it's from the 1890s and has a ticket price of £25. you might need a better price than that from dealer Howard. -Would you do the two at 40? and buy big on this last leg of the trip. and they'll make a nice little lot in an auction room. I should bag 10-20 quid with those. that will help him maintain his lead. -That's a nice Arts and Crafts thing. Yeah, not quite what I had in mind. It's a kettle stand with engraved copper skin. room to haggle with dealer Danny. It is a fiver, exactly, spot-on. -Yeah, I'll buy that, fiver. -Come on, put it there, man. -Thanks a lot, you've been really good. If it sells well, he could make a decent profit on that fiver. -There you go, young man. -Would you like some change? It's a good little thing. The sort of thing Anita loves. She'll love it even more if you make a loss on it, ha-ha! for a completely different reason. for many of London's important figures. James is meeting Ian Dungavell from the Friends Of Highgate Cemetery. Let's hope he doesn't "corpse." -Very good, nice to meet you. creating new private cemeteries around London. and to offer a safe resting place away from grave robbers. of many famous scientists, politicians and entertainers. and he's got his very docile Lion, Nero, sitting on top of his tomb. The lion was so tame that children could come up and stroke him. Yeah, or "wild animal proprietor". author Douglas Adams and painter Lucian Freud. safe from pilferers, body snatchers and anatomists. Here you are in a massive, vaulted, top-lit space. so it's quite light and bright. You could see more than you can nowadays. And then you would come in and visit the vault of your loved ones. where they've lain undisturbed for over 150 years. In the 1850s, the cemetery expanded eastward on a more modest scale. Nevertheless it's still attracted the attention of the noteworthy. although he died in 1881.
is a real focal point of the cemetery. of punk impresario Malcolm McLaren. You've never seen anything like this in a cemetery. He holds his own in the cemetery. Yeah, it is, the new with the old. who've been restoring and conserving the site for future generations. Ian, thank you very much indeed, it's been absolutely fascinating. Amongst the living dead, really. -Yes. Come back again. There's lots more to see. and made her way up to Watford. and is hoping to find something that will give her the edge over James. -I'm Anita, and it's lovely to be here. You've got a bit of everything in here. -You can have anything from £2 to £2,000. What's selling well just now? could really make a difference in buying right for the auction. and hope that will do well down in Green-ich. That sounds like a medical condition. and it looks like she may have found it. It is a rather interesting set of silver condiments dated 1889. Now, silver can be a good buy, but it does depend on the price. is probably around about 100. That's too low. Can't do it. Bottom price, it's got to be 125. -I can't do it any cheaper than that. -Could you bring that to 110? I'll tell you what, cos it's you, I'll knock another fiver off. It can't be any lower. -That's lovely, thank you very much. that could shine the light on Anita's profits. But she isn't stopping there. I like this little jug. I'm not even going to look at the price. Don't tell me. Can I buy that for 20 quid? Nice try. It's ticketed at £90. So, you better look for something else, girl. But you might not want to spend all of that. These look quite interesting - at the right figure! I think I'll have a go at them. are being sold together at £55. However, they've been badly restored and that will affect their value. David, I had a look at these figures and I think they're quite sweet. Could I buy them for £20? There she goes with those £20 again. But considering the damage on both of them. Could you take it to £25? They're damaged, so I'll do it for 25. £30 off, could they be the item that put Anita in front? as we reveal who bought what. Oh, looks like two coffins. This is my favourite bit and I cannot wait to see what you've bought. -You go first this time. -This is my final batch. -Do you like that box? -Pick it up, go on. -It's just my type of thing. That's the sort of endorsement I like from you. Is someone regretting the purchase of a cuddly deer? I'd like you to meet a couple of pals of mine. Wee? There's nothing wee about that. I had to rescue Bambi, who's only got one eye. -And much did you have to pay for that? I think that's a winner. I don't think I could live with it, but I'm sure somebody else can. The only problem is it's got mange. My second lot is Miss Havisham. Anita sure has some Great Expectations for this one. It's a beautiful Victorian frock. -She's not really filling that yet, is she? -That's not bad. You've got a lot of kit with that. So, James, he very last reveal. I think we deserve a wee treat, are you paying? Um, no, you're paying. No, I'll pay. and tell us what you really think of each others items. How did James Braxton do it again? That box was to die for. it was so beautiful and just the type of thing that I love. But not only did he buy it, he bought it for £85. That's a bargain and that thing is going to sail. Anita - some fun lots, the fawn, the fawn with mange. That will do well, so will the dress. has many items, all the original spoons, it's all there. It's been an eventful concluding leg for our two excitable experts. and a deciding auction showdown. the National Maritime Museum and, famously, time as we know it. Getting out of this car doesn't get any easier, does it? and it's the place our winner will be anointed. Auctioneer Robert Dodd will be on the podium today. But what does he make of James and Anita's choices? The Art Nouveau box, the jewellery box is lovely. and I hope whoever bought it...got that thrown in with something else. Hey, he doesn't mince his words. and has gone on to spend £238 on five auction lots. also for five auction lots. There's just £72.58 between them. So, without further ado, let the final auction begin. First out of the trap is James' gilt convex wall mirror. Bid remains on this at £22. £30. Two with me. Five. I'm out. 45. 42 with you, sir. Last time. At £42. After costs, it works out as a loss for James. Let's hope it doesn't reflect too badly on the other items. That was my charity buy. so can we find a home for Anita's carved Black Forest cane handle. The bid's with me at £22 on that. 25. It's worth more than that. 25. 28. 30. 32. 35. I'm out. 42 I've got on the phone. 45. Looking for 48. 48. Looking for 50. £50. I'll take 52. 52 on the telephone. 55 in the room. 58 I've got. 60 I'll take. Are we all done? Last time. £58. Yes, she did well there. More than doubling her money and narrowing James' lead. Things are hotting up. Let's see what James makes on the silk fan. Start with 55. 60. 65. 70. 75. 85. 90. Looking for 95 anywhere. 95. 100. And five I'll take. 105. 110. 130. 135. 140. Last time at 140. James gets right back in front with an impressive £55 profit. Next up, could the damage spell disaster for Anita's ornaments? £18 on these. 22. Five. £30, I'm out. Looking for 32 on these. They're worth that. £30 on these figures. After costs, she's just about broken even. James started with a lead over Anita of just £72.58. She's got to do better if she wants to win. Next under the hammer are James' two Victorian gems. £32. And that is cheap! Looking for 35 on these. -42. 45 I want. 45. 48 I need. That's it. 55 I've got. 58 I want. You sure? At £55. £55 makes a small profit for James. He's still ahead. -I got away with that. We're on to Anita's Victorian silk gown with mannequin and boa. Let's see how popular it is with Greenwich's fashionistas. £50 on this. Looking for 55. 55. 60. 65. 70. 75 I need. 75. 80 with me. Looking for 85. Are we all done? £80. That's a good result for Anita. It was a bit of a gamble, but it paid off. Can James make a similar impact with his kettle stand? Bid is straight in at £10. 12. 15. 18. I'm out. £20 I want. It's worth that. £20 there, I'll be back. £30. Are we all done? has paid off handsomely for James. Speaking of handsome, here comes Anita's cyclopic cuddly dear. but what do they buyers see? Bid with me at £10 only on that. 12. 15. 18 I need anywhere. 18. 20 there. Looking for 22. -If you don't like it, sir, you can make it into a pig. 35 in the back of the room. 38 there. 40 I've got in the back of the room. Looking for 42. 42. Take 45. Are we all done? Last time. A remarkable result for Anita. She was confident it would sell and she was right. Had it had two eyes it would have been a tenner. and it all comes down to a battle of the silverware. Looking for 90. 90. Five. 120. 125. 130. I'm out. 140 there. Looking for 150. 150. 160. 175 I've got. Looking for 180. 180. 185 on the phone. 190 in the room. Over £100 profit. James is stretching out in front. Anita needs to make a big profit on the silver condiments to win. £55 profit is a good result, but is it good enough? Will we get a cup of tea and do the sums? Cup of tea, sums, and it's all over. Anita started this leg with £452.86. ending the week with an outstanding total of £530.56. and also winning this week's road trip. Remember, all these profits go to Children In Need. James, congratulations. You were wonderful. -But I want you to take me for a typical London lunch. Eels, love. Whelks and eels. Come on, get in there, love. after all, it's been an eventful week for our talented duo. It started out rather heavy-going. And for James things got even harder. which I normally do when concentrating. They picked up bargains, going for a song. And empires rose and fell at the drop of a gavel. I'm awful tempted with Napoleon. I think a lot of women were. But most of all they had some unforgettable memories. -You're coming home with Mummy. Oh, good lord. That's reverse by the way. a Highland caper... in a Sunbeam Rapier.